As I am completing the last trilogy of Dragonlance books, that I have not previously read, the end of this blog is moving ever closer. I know, this is not the first time I have written crap like this, but this time it is not so much about being bitter about the lack of gaming material or novels, it is more about a sense of fatigue. When I started this over on Blogger it was a therapeutic exercise as well as a way of sharing the working I had done over the years. Of all the game material I have created, I have published what I thought was usable. I have read pretty much all there is to read when it comes to Dragonlance, and I have failed in finding a good substitute that I feel like writing about. When I look through the last couple of posts on this blog there are way too many Youtube videos and tweets, which is really not the point of having a blog. I recently renewed this domain, for some odd reason, so the blog will remain here for a little while longer. When it is up for renewal, I will move the content somewhere else, probably WordPress.com. I have been reading The Messenger this weekend. Well, I have read two chapters that is. Between three children and a new kitchen project that was about what I had the time for. That, however, is not necessarily a bad thing. This way the series will last longer. There’s not much to say about it yet though. It is set in Icewall, which I think it really great and makes for an interesting setting. And then it’s written by Chries Pierson who is one of my favorite Dragonlance authors. 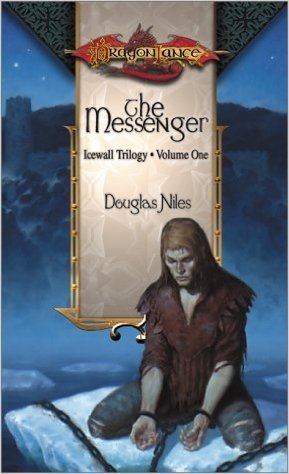 So, if you are still feel that Dragonlance itch and have not read this trilogy yet, so far, I can recommend it. Oh yeah, it is still on Amazon. For some reason I have developed this unhealthy obsession with collecting (and reading) some of the Dragonlancde books I never got around to reading when they were released back in the day. My summer project “The Elven Exiles” ended happily after a little extra work, so now it is time for a new one. The Icewall trilogy is my next obsession. I am a huge Douglas Niles fan, so it makes sense to get this one. Besides, I always had a soft spot for Icewall, and I would like to see that area of Ansalon fleshed out a bit more. Compaed to Elven Exiles, this trilogy was a bit easier to get a hold of. It only took a few searched on Amazon to find all three books from a seller who would ship to Scandinavia. So, now I just have to sit back and wait. The books should begin to arrive sometime next week, but I think that is a little optimistic. As it is, I don’t mind that much, since I expect to read this trilogy during late fall when the weather gets all icky. crush: "I've never seen Star Wars"
Just testing Google+ integration. Nothing to see here. For some odd reason I am feeling the pull towards roleplaying games again. It’s like cigarettes, every once in a while the old urge emerges and it takes a little will power to stay off the cancer sticks. Luckily, RPGs don’t cause cancer as far as we know, so I can safely induldge. Usually I listen to tech podcasts but I am in the process of gathering a list of great podcasts that I listen to. Without further ado, here we go. Our good friends from the Dragonlance Nexus have their own podcast where they discuss various things but focus on Dragonlance. The podcast actually made me buy the Elven Exiles trilogy a few weeks back, so I definitely recommend it. It’s also the last remaining bastion of Dragonlance so go support our guys. This is another great podcast that discuss a wide variety of RPG topics. Right now I am listening to an episode from 2011 where Mortellan of Grehawkery fame talks about that setting. Really good stuff in my humble opinion.